The LSU Agricultural Center’s Southeast Region hosted a Volunteer and Leadership Development Training at LSU for 4-H Club leaders and volunteers on Sept. 26. Volunteers from throughout the 16-parish region had the opportunity to participate in workshops to learn more about the program. Lacey Jewell, West Feliciana Middle School 4-H leader, and Paul Theriot, West Feliciana High School 4-H leader, attended. Workshops included 4-H 101; Volunteer Impact; SET-National 4-H Day of Science; Citizenship, Service Learning and State Service Project; and Hands on Healthy Living. The interactive Volunteer Impact workshop introduced volunteers to a new tool. In the Citizenship, Service Learning and State Service Project, volunteers learned the difference between community service and service learning, and how to incorporate service into school and 4-H. Volunteers learned the 4-H pledge doing yoga poses, participated in interactive nutrition games and made smoothies using a blender bike. Roundtable discussions on Citizenship Washington Focus, parliamentary procedure, master volunteers, Youth Wetlands Week, Day of Service, youth voice and accommodating special needs followed the workshops. 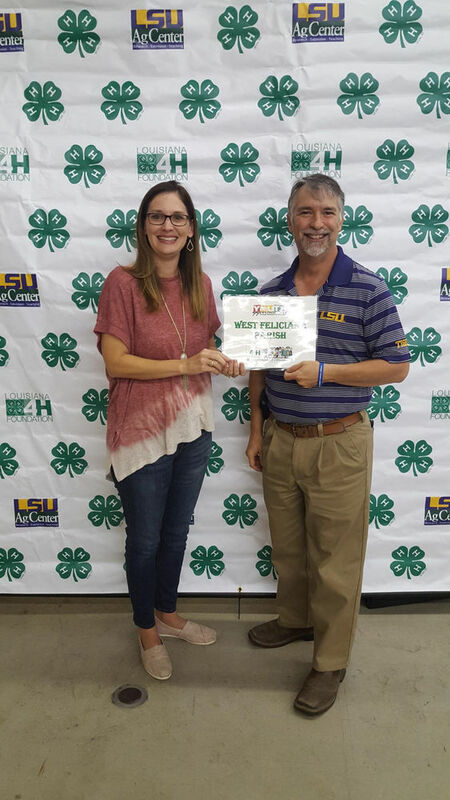 For information about the LSU AgCenter or 4-H Youth Development Program, contact the West Feliciana 4-H Office at (225) 635-3614.